Posted on February 19, 2017 by Kate Nakamura / This entry was posted in Informative and tagged brooklyn, bushwick, grasshopper, grasshopper vape, herbal, herbal vaporizer, new york city smoke shop, vape, vaping, vaporizer. Bookmark the permalink. With the new Grasshopper vape pen, dry herb vaporization never seemed easier! Cleverly disguised as an actual pen, this portable device is as functional as it is stylish. While you sacrifice a longer battery time with its compact design, charging the Grasshopper is as simple as can be. 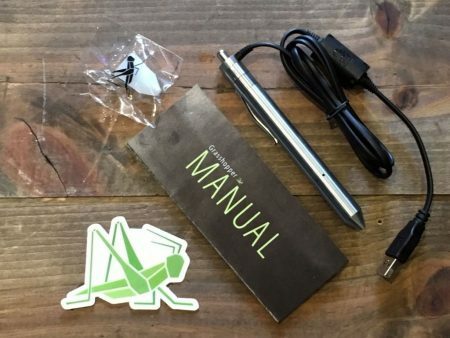 The Grasshopper requires a recharge after 3-4 loads but comes with an easy to use USB charger. Just plug it in and slip the charging ring over the power button. Super easy! If you can’t wait for it to charge up that’s okay, the Grasshopper can be used while charging. Because of its 45 watt convection heater, the Grasshopper boasts a unique 5 second heating time. 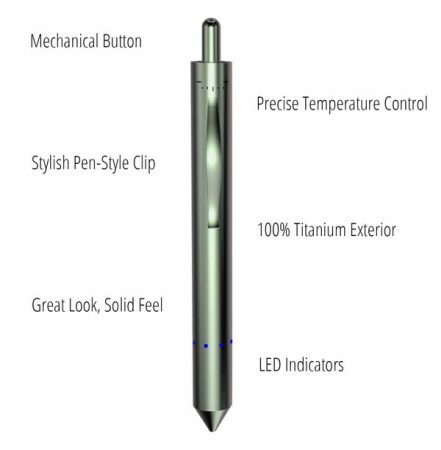 The reviews are mixed on this facet of the pen, some experience overheating, others argue that that is not an issue. Either way, the Grasshopper is functional with a 14 mm waterpipe or an 18mm waterpipe using the silicone mouthpiece that comes with the pen. Another suggested way of avoiding the heat of this pen is simply clicking the device off after each draw. The heating system is also adjustable. Depending on your preferred way of vaping (higher temperatures meaning larger draws), the Grasshopper comes equipped with a user friendly dial on the top to adjust temperatures. This device also comes with LED indicators, letting the user know when it is ready to go or the status of the battery. A chart included in the manual will shed light to the meaning of each signal. How confident is Hopper LLC in the durability of their product? The Grasshopper, made from either stainless steel or titanium holds a limited lifetime warranty. Barring that you haven’t tried to destroy the pen yourself, you can send it back to the manufacturer for repairs or replacement. 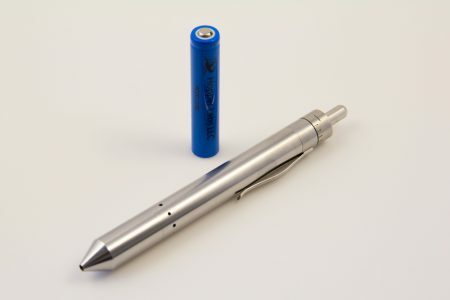 The battery for the Grasshopper is a unique one which can be bought through their website at a fair price. Though their battery certainly packs a punch, the fact that it is custom designed to be so compact and powerful weighs more as a con than a pro. When cleaning this vape it is important to do your research before you dive right in. You may risk making your device unqualified for its lifetime warranty conditions. A recommended method of cleaning to upkeep your vape is cleaning the screen after each use. The screen, while never having to be replaced, does fare better when scraped clean. And because of its stainless steel nature, scratching to the screen will be out of your worries. Further cleaning should also be performed every few months. The suggested route includes removing the mouthpiece and soaking it in isopropyl alcohol, allowing to dry before replacing it back on the device. Next, you must void the oven of all herbal residue by shaking it out or using a q-tip to clear the chamber. Do not remove the screen. Run the device on temperature setting 5 to make sure the excess herbs are cleared from the oven. You may also use a q-tip dipped in isopropyl alcohol to ensure the cleanliness of your chamber, it is suggested that you perform this task with the chamber facing the ground as to ensure no leakage occurs into the device. Because the power of the vape runs through the body instead of wiring within, making sure the threading in clean is also of high importance. The Grasshopper is a definite recommendation if you’re in the market for something compact, efficient, and super user-friendly. 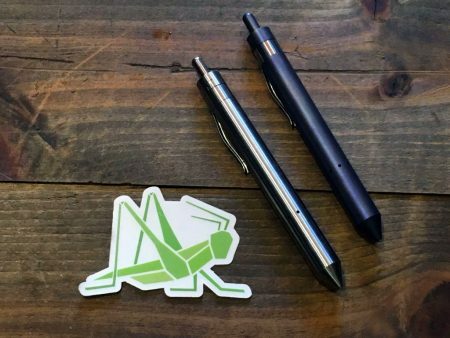 The pen comes with a charger, a mouthpiece, a helpful manual, and a cute little grasshopper sticker. The Grasshopper comes in two finishes the Stainless Steel, and the Titanium. The Grasshopper comes ready to fire so just pack, click, and you’re ready to go! Just be wary of where you leave it, it does not actually function as a pen despite its convincing facade.